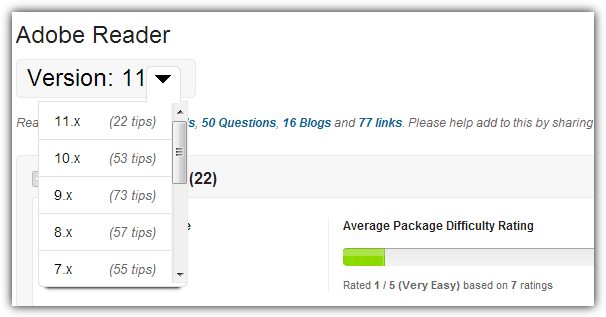 If you want to Install a piece of software, it’s obviously very easy to do generally speaking. Just run the setup file, agree to the license agreement, select destination location to install, confirm the program’s shortcut location, create desktop and tray icon, and finally install. It looks like many steps are involved but we usually just ignore all those and continue clicking Next until the setup completes. Obviously, these days you have to be a bit more careful because of all the extra options during installation such as installing toolbars etc, but it’s still pretty fast and easy with common sense applied. Installing an application one time on your computer is not a problem but what if you have just installed Windows and have loads to install? Or worse still, what if you need to install applications on several computers? Sitting there and installing each program manually can be frustrating and a huge waste of time and something you’re not going to enjoy doing. Do we all want an easier solution? Of course we do! The useful things is, there are hidden command line switches in most installer packages or setup files which be can used to bypass all those confirmation message boxes. With these commands you can install just about anything automatically, if you know the commands to use. Some software developers will include the command line switches in their documentation but many do not and you have to search the internet to find what they are. Thankfully, there are a couple of easier ways to find the unattended install switches and install software silently. There is a way that you can sniff out and find the silent switch for a number of setup files. 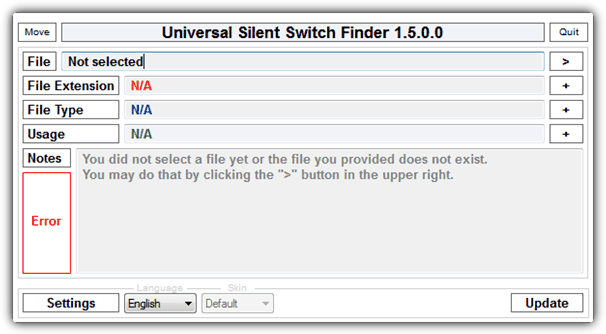 Universal Silent Switch Finder (USSF) has been around for many years and was used by XP custom install programs such as the Windows Post Install Wizard (WPI) among many others to determine the silent switches for unattended installs. The program itself is very simple to operate and is also portable so no need for installation. All you need to do is just run USSF and load the setup file. USSF will then automatically analyze the file and tell you what type of installer package is being used to pack the files and also the command line switches the installer uses. You can then use those switches in other programs, batch files, scripts or from the command line. To show how the program works, we’ll do a simple test. Let’s say you want to find the silent switches in the setup file of the excellent Malwarebytes AntiMalware (mbam-setup-1.75.0.1300.exe) because you always install it on your own, or your friend’s computers. 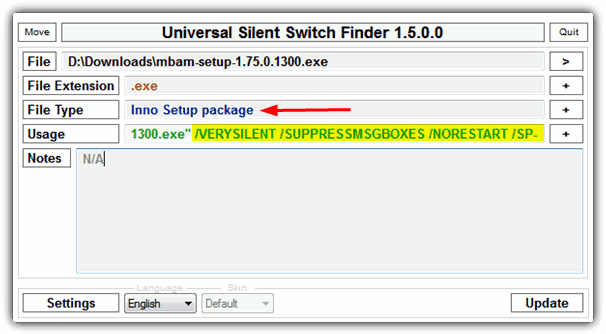 Run Universal Silent Switch Finder and click the > button on the File line and load the mbam-setup-1.75.0.1300.exe file. Once loaded, it’ll take a few seconds to analyze the setup file and then show the available silent command line switches. If we test this from the Command Prompt, Malwarebytes will install to the default location without popping up any dialog window, and also create a desktop icon and start menu entry. Basically, USSF uses PEiD to identify the installer type and reports available switches accordingly. Mileage will vary from file to file, some will work and some may not completely install silently or not be recognised at all. This program though, is the easiest way to find the switches for setup installers. Although USSF is a very useful tool, it does have a drawback which is the program has not been updated for several years. This means that as new switches have been added to setup packages, USSF is not able to pick them up. It also won’t find switches from custom installers or those to avoid extras like toolbars etc. There is however, a website resource which is dedicated to gathering the information required to deploy setup installers in an IT environment. Of course, anyone is welcome to take advantage of the switches found on the website. Previously called AppDeploy, ITNinja has a massive database of over 350,000 software titles where you can browse and find the information you need. Simply type in the name of the software into the box and search for it or browse through the database manually by software title or company title. Then you can browse through the tips left for installing different file versions as well as FAQ’s and various other snippets of information. As the database is filled with so much information for multiple versions of software, it may take a few attempts and a bit of time to find the right combination of switches for your purpose. But as an all-in-one resource for finding setup installer silent switches, ITNinja is hard to beat and a great way to get the commands you need if USSF fails. I’m finding that USSF cannot detect EXE files created with Install Shield. Says it’s a valid PE file, but could not identify the type. Who actually wrote this software and can it be updated? Thank you Raymond, this freeware is good. One of the coolest find of this week Raymond. Quite a geeky tool, IMO. Great tip Raymond! I guess using this software we can find command switches for different software and integrate them into Windows to create a Windows unattended CD.